The Nature’s Promise Collection from Trollbeads will be coming out September 15th, with pre-orders starting on the 8th. That day I will publish a live image preview of the entire collection, like with last spring, winter and fall. At that time all the descriptions of the beads will be made public, so what I’d like to do today is just show how the beads can be integrated with older beads. Let’s start with a photo of the whole kit. On the top row, left to right are Marble, Sparkling Moss, Slumber, Forest Mist, Leaf Fall and Marble Dot. The kit will be $170 USD/$221 CAN or separately each bead will cost $34 USD/$45 CAN. The Forest Mist sample I have is so beautiful! I love the pastel colours in it. Marble is quite striking and will be wonderful for neutral combinations. I like how Sparkling Moss appears to be glowing. Slumber is a lovely mix of cream, soft yellow and fresh green. 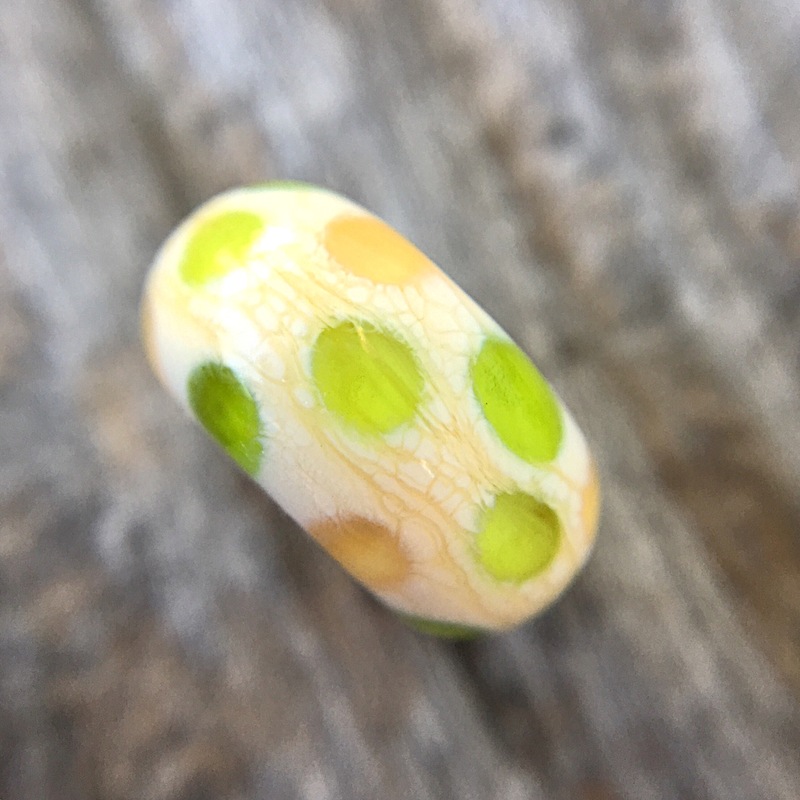 Marble Dot appears to have a small amount of glitter in the dots. Leaf Fall is a deep orange with some glitter. So, for each bangle the stoppers used are Night Sky and Sneaky Fox. Let’s start with Sparkling Moss. Left to right are Aqua Edge Pumpkin, Milan, Sparkling Moss, Black Silk and Aqua Edge Petals. For Forest Mist I chose to bring out the yellow and pink. Left to right are Pink Conch, Beige Bubbles, Forest Mist, Gold Silver Trace and Pink Desert. 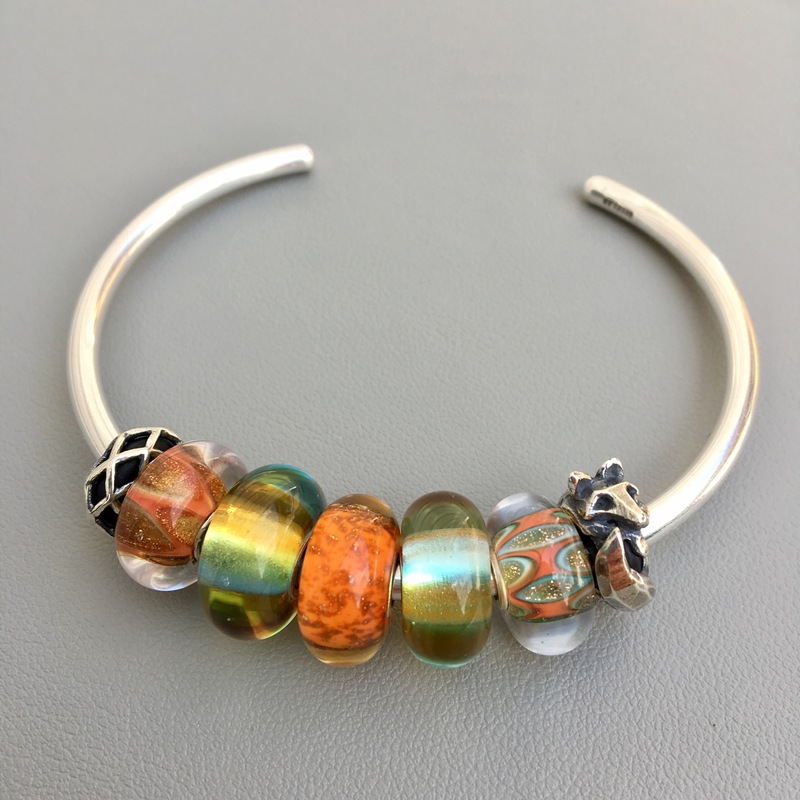 Leaf Fall is a pretty bright orange, so I went with Love & Laughter, Green Rainbow, Forest Leaf, Green Rainbow and Once Upon a Time for this bangle. This combo might be my favourite-Beige Bubbles, Slumber, an Amber Unique, Peter amd Gold Silver Trace. 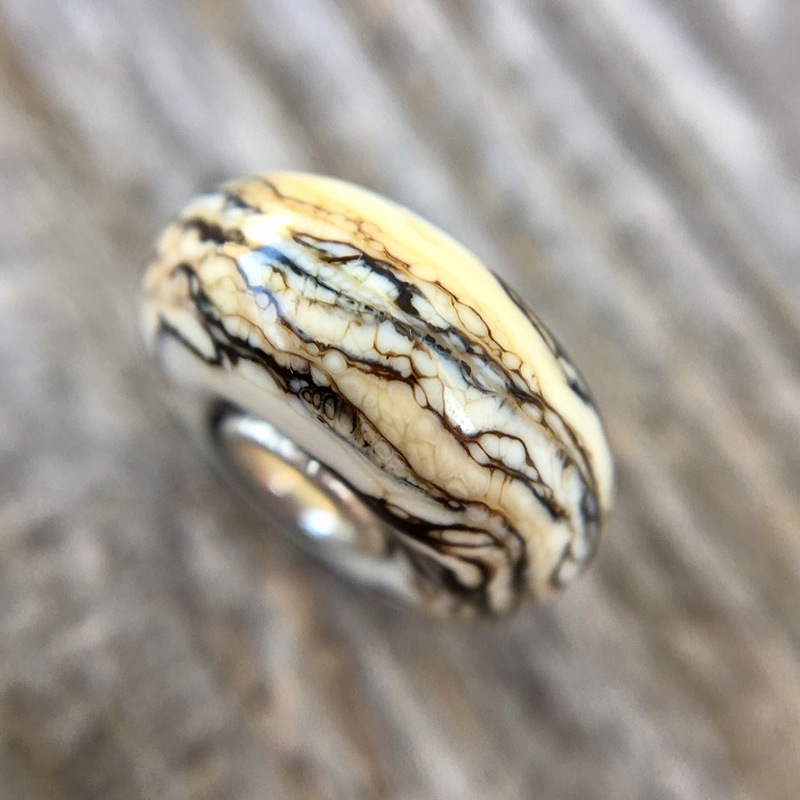 I thought Marble and Marble Dot obviously needed to be used together, so here they are with Black Onyx, Golden Cave and the Golden Rutilated Quartz. Finally, I remembered to use the new Star Bangle for a photo! 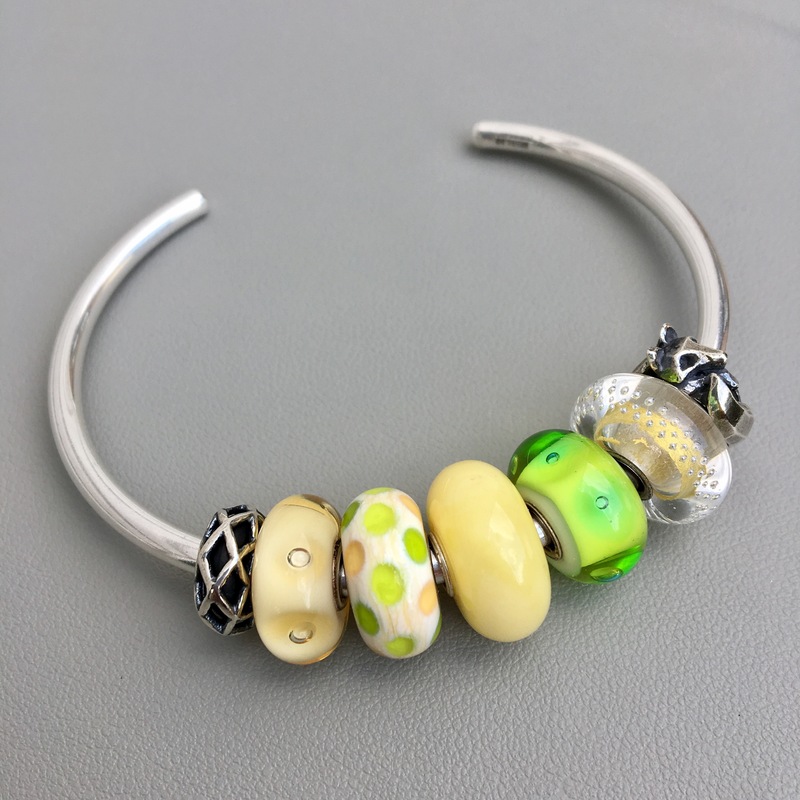 Finally, here’s a bracelet using the whole kit plus the Capsule of Life Spacer (and OMG I love this spacer! ), Wise Owl, Infinity and Trunk of Treasures. So, obviously the question is, does any bead strike your fancy? I find them all to be quite beautiful but Slumber and Forest Mist have me looking at them over and over again. This is a remarkable and superior collection, isn’t it? I love all of the glass, the fox stopper, all the silvers actually! 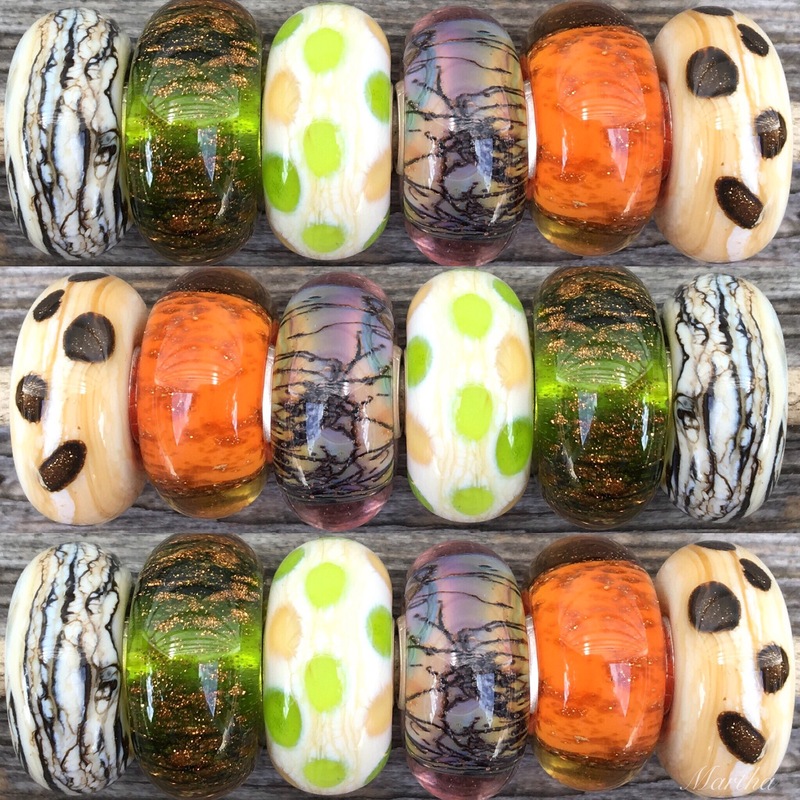 I also love autumn in Canada and know I will buy quite a few of these as I don’t have many autumn themed beads. 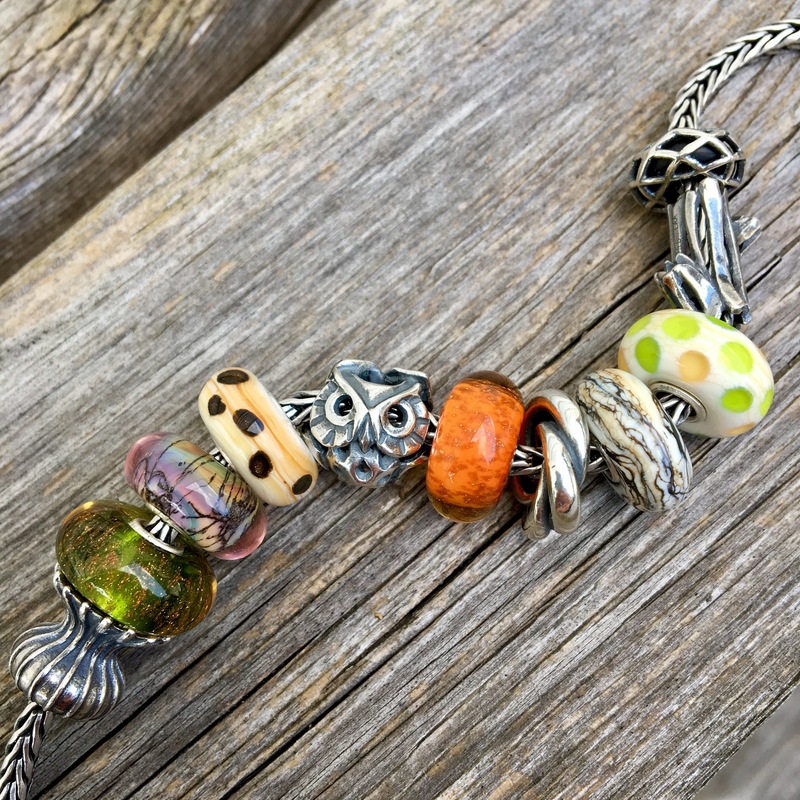 Pandora has nothing to compare with this collection this fall, which suits me, so I can devote any bead money I have to Trollbeads. I love the Star Bangle and Ring of Change and think the Capsule of Life spacer are all beautiful. How I wish we had more proper Trollbeads stores, in Ontario. I will go to the Brampton store to look at the new releases in a few weeks. Forest Mist will be the first glass bead on my list, likely two of them, as they are pure magic. Thank-you for the wonderful photos and for leading me down this beautiful forest path. Sarah, I really hope you can find two Forest Mist beads that you like. The sample I have has so many different colours in it that I think I’ll wear it alone today so I can enjoy it without distraction. The Star Bangle is going to be a favourite of mine from this collection as I just adore the texture. 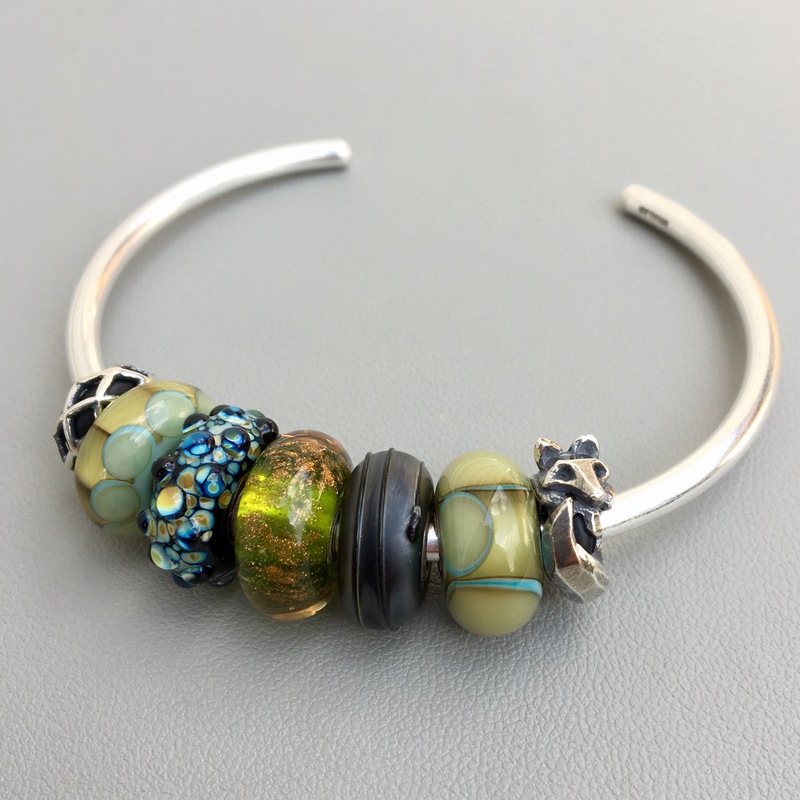 I really like the Ohm Beads Dirty bangle and bracelet because silver and light coloured beads really pop on them and this bangle will give a similar effect. And the Capsule of Life Spacer on the Star Bangle is really modern looking-like art on a wrist. It’s dizzying and and I’m so enjoying looking at your photos. You’re a superb ambassador for Trollbeads! Hi Martha, Forest Mist, Marble, Marble Dot, two Sneaky Fox Stoppers and a bangle please! That would be a lovely selection! 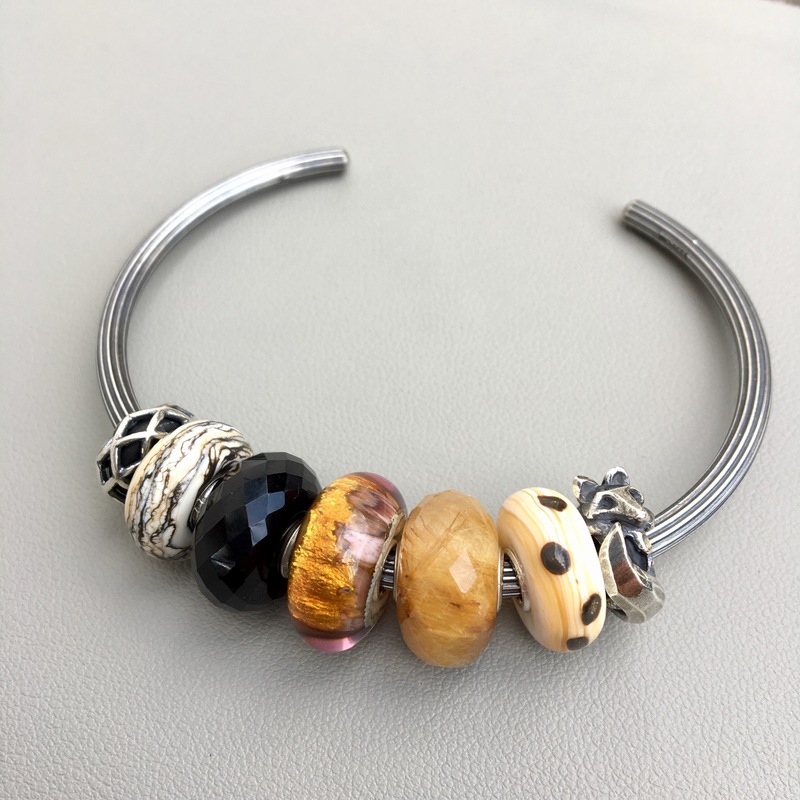 A perfect autumn bangle! This really is such a “magical” collection. I think my favorite bracelet combo (besides the last full one) is the star bangle. Just love all those darker colors for fall. Capsule of life, I agree is such a wonderful, interesting piece, seems to me it’s made to be worn asymmetrical, which of course, I love. 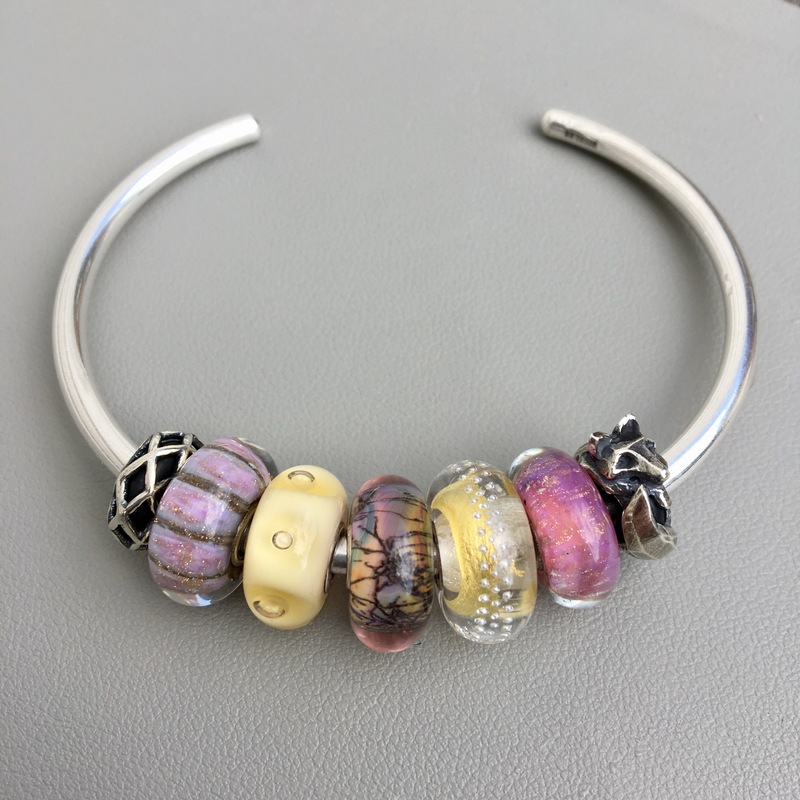 The glass is hard to choose because they all complement each other so well, but slumber and marble look like they will blend so nicely with what I already have as well as the faceted beads. The whole release, including the faceted glass has such a sophisticated, artistic and upscale feel to it. 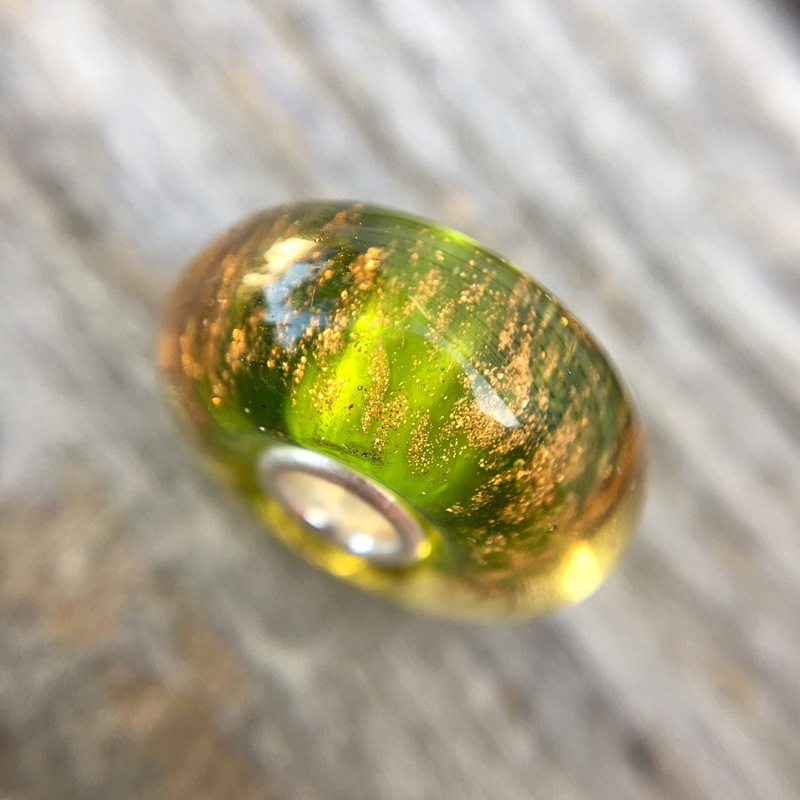 I agree with Sarah, there is virtually nothing from Pandora Autumn that I want (which in my opinion, is the exact opposite of this release), making my focus entirely on budgeting for Trollbeads! Tanya, I like your description of the release and totally agree. I’ll have to do a blog post soon on the Wise Owl, because the back of it is just delightful with what looks to be an acorn and some leaves. It’s like a tiny sculpture. The faceted beads really are incredible and I love how they are opaque. When Laura was showing her Acorns bead I was practically drooling! I shall look forward to seeing what you get and how you style it! 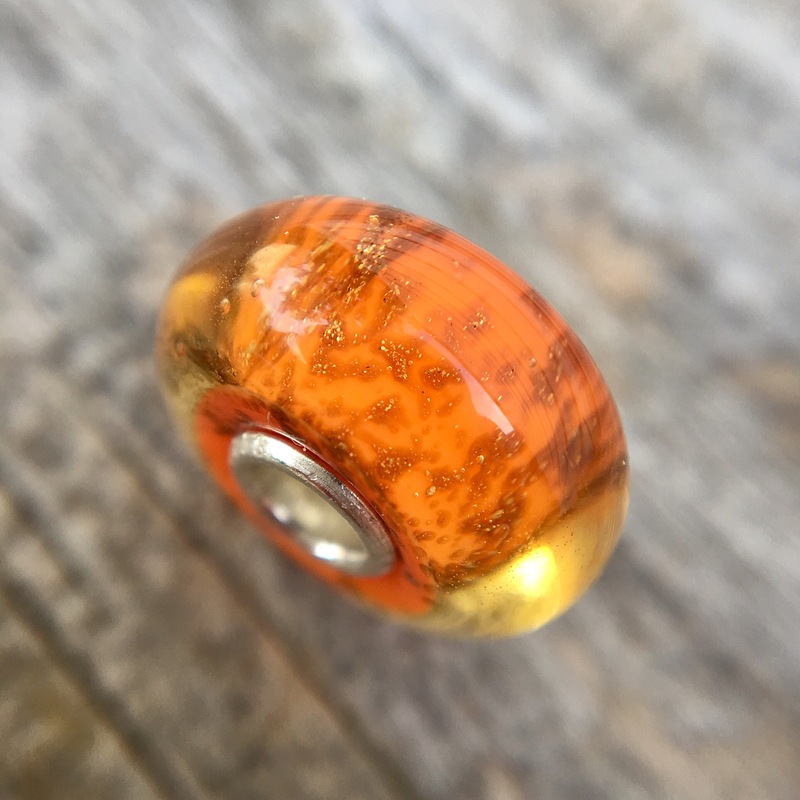 I think this is a really strong collection – the best from Trollbeads in a long time. I like this whole kit, but my favorites are Forest Mist and Marble. Your Forest Mist is stunning – I love all the colors, and I hope I can find one like it. I also really like the stoppers, especially that adorable Fox! I like Night Sky a lot too, since it looks to be a decorative, very versatile design. And the Wise Owl is very cute too. Argh, just when I thought I could safely concentrate on True Beadz and Ohm for a while, this has to come out – and the wish list grows! Thanks for the lovely shots – it’s always so helpful to see live images. Although your live images made my wish list grow even more, haha! Kim, I’m so happy you find the live images helpful. I don’t know how Forest Mist always appears to be glowing, but I guess that’s the magic of glass. The Night Sky spacer does indeed look to be very versatile, kind of like the Sunbeam Spacer, which I have a pair of and use all the time. Actually, that gives me an idea. I need to put every Trollbeads decorative spacer on a bracelet or rod so we can all get a size comparison. The fall is such a difficult time to prioritize bead purchases. I’m lucky to get so many samples, because there are always lots of back to school fees for the kids at this time of year. Fortunately these are not limited edition so can be purchased over time! Kim, I was mixing up Forest Mist with Sparkling Moss. Yes, Forest Mist has so many colours in it and is so pretty! I must say I find the names confusing lately too – when I started collecting, it seems they were much simpler – Blue Dots, or something like that! 🙂 Now I just say, “the green one with glitter.” You’re right, at least these aren’t limited, so there’s no rush to immediately buy. Kim, in my head I say Marble-awesome green one-green dots-colourful one-orange one and Marble Dot. Which is why no one is paying me to make up the names! I assume you’re going to the GLB event again? 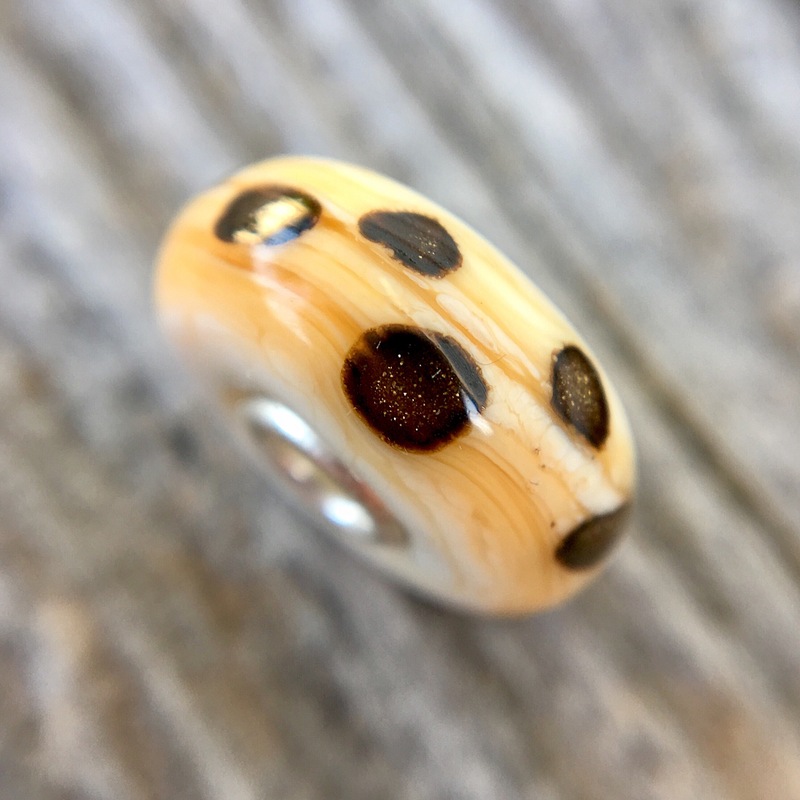 You should be able to pick out a Forest Mist there and if you go on the Facebook page for Trollbeads Freehold there’s a man unveiling a Limited Edition Event Bead Kit of 4 stones which you get to hand pick. So many choices! Yes, I’ll probably run down to GLB, although I was thinking I might just go for one day this time instead of the whole weekend. I’ve really been going crazy over all of Julia’s teasers of the Treasures and wouldn’t mind snagging a few of those. Are you going down this time? 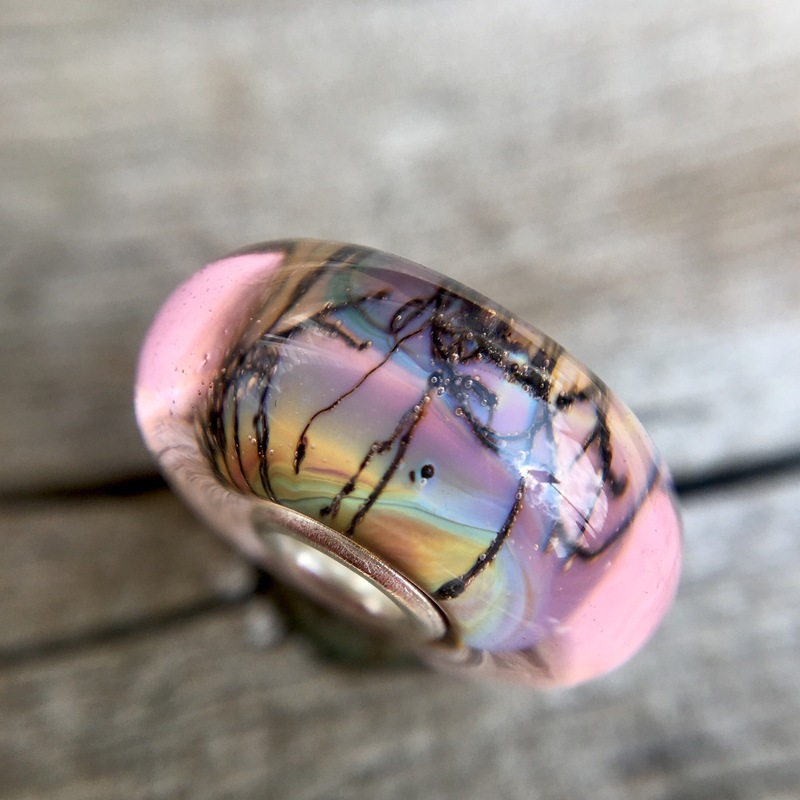 And I’m glad I’m not the only one who can’t keep the Trollbeads names straight! No, not going down but yes, lots of Treasures to drool over! If it was just a couple of hours away we would go down just for the day also! Funny you should say that about the birch bark as that’s exactly what my friend said about Marble the other day when I showed her the beads. Sparkling Moss is a deeper green than the Earth bead, although I suppose they will all have some variation. I love your bracelet idea! Hi Suzanne, yes, they are definitely making people dizzy! I can only look at the first one or two, not the 3rd or 4th of each set. My favourite is the True Beadz one as the colours are so soft and pretty! Forest Mist immediately caught my eye, although I’d definitely have to pick that one in person. And I do enjoy the sneaky fox. Yes, of all the glass beads it seems like Forest Mist has the most variation. Of course, I’m basing this on the half dozen or so I’ve seen on Instagram, so what do I know? 😀 Wise Owl is really cute and I like it on a Fantasy Necklace, too. Hope your girls had a great first day of school, Tracy!